Colonial Rose Inn Our records show that this inn is closed. Dixon bed and breakfast travel guide for romantic, historic and adventure b&b's. 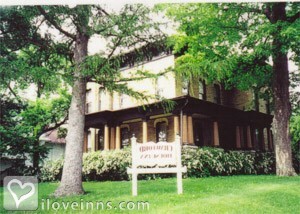 Browse through the iLoveInns.com database of Dixon, Illinois bed and breakfasts and country inns to find detailed listings that include room rates, special deals and area activities. You can click on the 'check rates and availability' button to contact the innkeeper. Dixon is a small city that is part of Lee County in Illinois. It is the home of the Lincoln Monument State Memorial, the exact location where Abraham Lincoln became a part of the Illinois militia during the peak of the Black Hawk War. The boyhood home of Ronald Reagan is here and another important historic spot in the city is Loveland Museum. For those who want nature and greenery, the best places include Lowell Park and Plum Creek Gardens, which are at Palmyra Road. To learn more about the city's rich historical legacy, visitors should also go to Lee County Historical Society as well as Dixon Historical Society. There are several Dixon bed and breakfast inns located near these attractions. By Crawford House Inn.